We're at the start of a new phase in our relationship with computers and programming, with our virtual worlds and personal data increasing at a rapid rate. This is partly because the number of computers we own has crossed the one-per-person threshold - from sharing a home PC, via owning our own mobiles and laptops, to smart TVs, set-top boxes, car computers, smart thermostats, smart lights, wearable devices and so-on. Computers are everywhere around us and merging into our surroundings, becoming almost invisible. But they're also all on the internet, communicating in ways we have no clear understanding of. We can't see what they're doing, and we can't program them ourselves. We're also now overloaded and overwhelmed with apps, services and log-ins, because everyone who makes computers and software wants to own a bit of our lives - and not share it or to work with each other. They jealously hide and lock away the slice of our life that they've seized. We've slid into a world of centralisation, silos and walled gardens. It's a control-based approach, where control is in the centre. You hand over responsibility to the suppliers of technology and may assume you aren't technical enough to see what's going on with your personal data or able to program behaviours and applications yourself - it's all alien and inscrutable. Our Vision: Power to the People! The vision of the Object Network project is to re-empower you, as an ordinary citizen of the virtual world. You should be able to see, control and program your own data and your own network of computers that manage it, whether that's a server, your home hub, your wearables, AR glasses or smartwatch, your connected devices. If computers are to merge into our reality, they should look and behave like that reality, which is a seamless, continuous landscape of stuff, where everything works together in intuitive ways. Reality is not at all like a competing array of remote, isolated and inscrutable apps and services. The Object Network will achieve this through a simple yet powerful tool: the mighty UID! Our Mission: Link all the Things! The Object Network's UID gives every virtual object a universally-unique identifier, like web links or web URLs. When everything you own or have access to is at the end of a UID, you have a solid handle on it and can share and re-use it. The biggest difference between the URLs you're used to, which are handles on web pages, and the UIDs of the Object Network is that our UIDs point to data: to live objects, things, or entities, like photos, messages, contacts, events, room lights and weather sensors, 3D entities and structures - even people, as avatars. These objects are just collections of properties, attributes or characteristics, along with links (UIDs) to other objects. This landscape of linked-up data requires that we agree on the shapes of these objects: all lights and contact cards should basically look the same everywhere. Each type of object has a natural interaction and can be weaved together via its links into an endless space that spans the planet and merges the real and the virtual. You can explore and interact seamlessly through this global space of stuff and places linked together, hosted on any machine, whether that's a remote server, our home hubs and wearables, our lights and switches. You can learn to animate these objects - create your own physical and digital realities, environments and structures, with rules as simple as spreadsheet formulae. If you're wearing AR glasses and grab a link to a photo or contact on your sister's machine in another country, that item can be transferred directly to you, peer-to-peer, without intermediaries. You should be able to open up an Object Network 'browser', then walk up to your thermostat or light and see it in 3D Augmented Reality. You should then be able to grab its UID, or see and set its properties, like the temperature or colour, or jump a link from the light to the virtual room it's in to continue your virtual world journey. You should be able to jump into a QR code representing a UID on a shop item or in a magazine, and see the object at the end of it: perhaps a contact card or an event for your calendar, or just a text explanation of something. Then go to the 3D space of the shop to explore more stuff. Maybe you could jump from the light object via a link to the online weather object that the light is watching - because it's setting its colour according to the forecast! You should be able to build your own places from links to stuff owned by you and others. You should be able to animate anything yourself by linking to rules - to set the colours according to whatever else you link to - switches, sensors or birthdays! If everything in your virtual world is just a link away, all your stuff and everyone else's can be linked up and work together, no matter who owns the computer that animates them. The simple yet powerful UID can give you back the visibility and control that you currently already enjoy over your normal reality, but which was lost in the virtual world through a proliferation of apps and services and accounts. 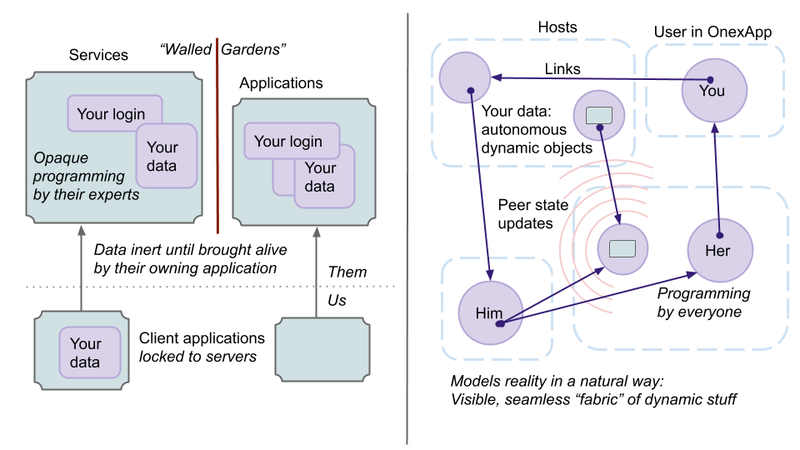 Objects linked by UIDs and hosted on any machine, even our wearables, can be used to build a seamless virtual world that breaks down those inscrutable silos and walled gardens. With Augmented and Virtual Reality and the Internet of Things just around the corner and bringing us a merge of the real and the virtual, that ease and empowerment will be crucial.